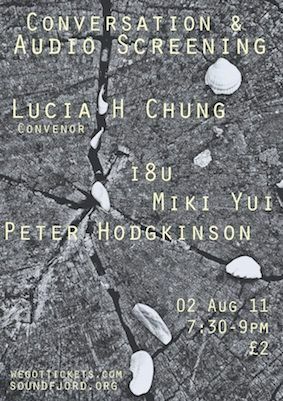 Audio Screening & Conversation | In Conversation with the Musesâ¦ | Lucia H. Chung (Convenor) with i8u, Miki Yui & Peter Hodgkinson | 02 August 2011 | 7:30-9pm | £2 | http://www.wegottickets.coââ¹m/event/127134 In response to an invitation to hosting an audio screening at SoundFjord, artist Lucia H Chung conducts an exchange project with artists who have inspired her artistic journey in sound and music making. This 8-week long exchange between Muki Yui, i8u and Lucia started from a collective contemplation on Yoko Ono's instruction Secret Piece (1953), first sent by Lucia to the other artists respectively. Responding to the material that they received, Miki and i8u returned their thoughts in the form of text, image and sound. Through this to and fro correspondence, the three artists shared a close and intimate conversation on time, space, memory and sound. This journey of exchange will be presented as a collaborative work that is exclusive to SoundFjord. The event will also be the premiere of an audiovisual work created out of a collaboration between Peter Hodgkinson and Lucia H Chung. 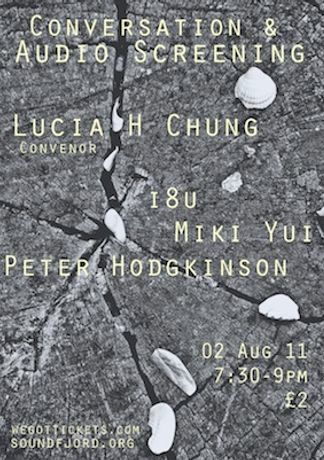 Finally, Lucia will talk about her forthcoming solo work on murmur records in Japan.